Our pick of natural looking Christmas wreaths that will last until twelfth night. Whether you hang them on the front door, above the fireplace, or in every window, these wreaths won’t wilt and they won’t break the bank. All are under £50, and wrapped carefully, you can store them away and use them again for many years to come. Mixed Pine and Eucalyptus Wreath with Twinkly Lights, £20, Dunelm. 2. Paper Ivy, Mistletoe and Christmas Rose Wreath, £34.95, Paper Tree. 3. Leaf and Berry Wreath, £29.99, Dobbies. 4. Variegated Holly Wreath, £42, Gisela Graham. 5. Green & Gold Berry Wreath, £25, The Contemporary Home. 6. Broadwindsor Pine Cone Wreath, £14.95, The Farthing. 7. Frosted Eucalyptus Mix Wreath, £45, Cox and Cox. 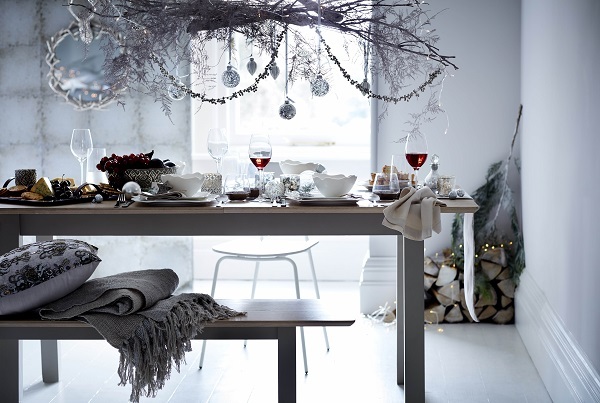 With Christmas preparations soon to be in full swing, here’s a little Nordic Christmas inspiration from Debenhams. Pared back decorations look sensational against plain white walls and simple furniture shapes. 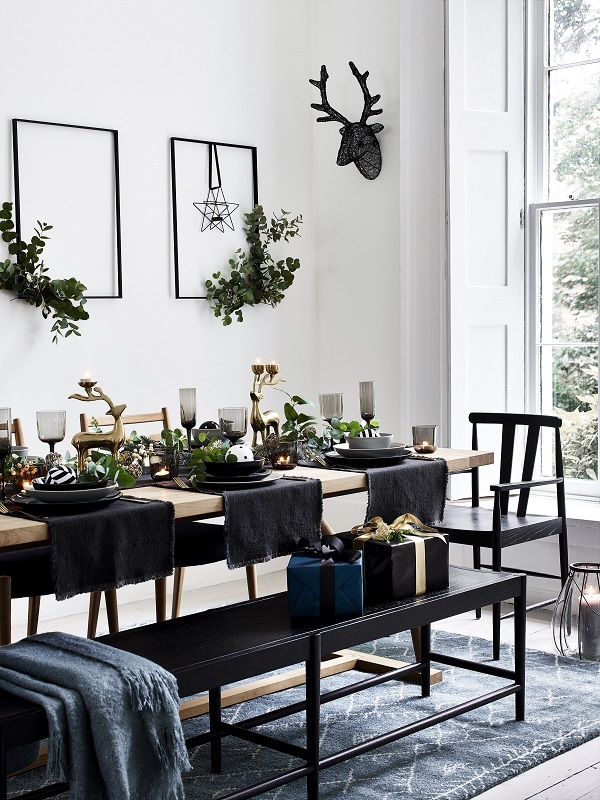 Lots of festive foliage and rustic wood bring the outside in, and soft rugs, cushions and throws add that extra layer of comfort that winter needs. Finish it all off with punches of black. Nkuku Hurricane Lamp - £60. Jute Baskets (2) - £26. Black Wire Star - £20. Blue & Gold Band Vase - £18. Nkuku Rectangular Lantern - £50. White Wool Tree - £15. Pre-lit 6ft Grandis Fir Tree - £250. Bark Tealight Holders - £10. Gold Glitter Stars (8) - £5. White Glitter Stars (8) - £5. Arlo Floor Light - £150. Grey Chunky Knitted Throw - £60. Grey Chunky Knitted Cushion - £25. Swoon Porto 2 Seater Sofa in Hunter Soft Wool - £999. Boston Large Extending Dining Table - £1,920. Boston Wooden Dining Chairs with Velvet Seat Pair (2) - £350. Boston Charcoal Carver Dining Chairs (2) - £399. Boston Large Charcoal Bench - £455. Wire Stags Head - £50. Blown Glass Hurricane - £32. Placemats (2) - £8.00. Nordic Smoke Wine Glass - £7. Nordic Smoke Flute - £7. Two Candle Gold Candelabra - £20. Eucalyptus, Pinecone and White Berry Garland - £30. Reactive Dinner Plate – £6. Reactive Side Plate – £5. Reactive Cereal Bowl - £5. Raw Edge Cereal Bowl - £5. Raw Edge Pasta Bowl - £6. Gold Cutlery (16 piece) - £35. Black Geo Baubles (4) - £16.00. Teal Faux Mohair Throw - £25. All from the Nordic Range at Debenhams. You probably think there is still plenty of time but Christmas will be here before you know it. 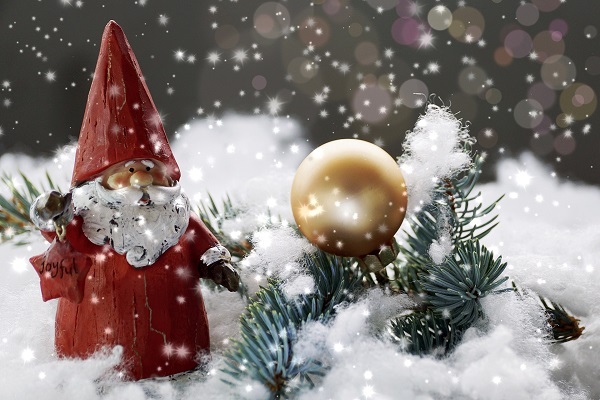 To avoid rushing to get everything sorted in last minute and to be able to enjoy the upcoming festivities to their fullest, it’s better to start early rather than late. That doesn’t mean you need to start with Christmas preparations tomorrow but it may be a good idea to set a date and stick to that date. Before you start decorating your home, looking for Christmas baking recipes, that perfect Christmas tree, … make a plan what you need to do to make this Christmas unforgettable. Not only it will help you stay focused and avoid forgetting anything important, it will also help you appreciate the time before Christmas which is very magical as well. If you want your Christmas decoration to achieve the best effect, it is of key importance for your home to be clean and clear of clutter. So, if you have postponed cleaning that ugly stain on your carpet, storing away your camping gear or have any other unfinished “business” requiring cleaning or organising (or both! ), you are highly recommended to take care of it as soon as possible. Remember, you can always call a professional cleaning company to do the cleaning for you if you are always running out of time for cleaning chores. It’s not difficult to get carried away with Christmas decoration. But if you think that there can never be enough Christmas decor inside or outside your home, you are very much mistaken. Sure, your home may stand out but it won’t stand out in a good way if your over do it. So, when you start decorating, keep in mind that less is more when it comes to both inside and outside your home. You can have the most beautifully decorated home but in order to enjoy it, it is of key importance to create a festive atmosphere. How? That’s completely up to you and your personal preferences but if you need some ideas, what about some Christmas-themed music? Also, don’t forget about Christmas food. It’s is, after all, a very special time of the year and it requires a special food. Last but not the least important, be sure to have everyone involved and don’t worry if everything is not perfect. The most important is for everyone to have a great time. Finding the perfect gifts (at a reasonable price!) for everyone is everything but easy. And if you are doing it in last minute, you are in big trouble. Bear in mind that the best things are sold out very quickly, especially if they have an accessible price tag. Also, it’s not unusual to panic when running out of time and believe it or not, last minute gifts usually look just like last minute and don’t really impress anyone. Let's talk about the Christmas table. Is it something you plan and prepare for? Taking the trouble to write place name cards and creating a spectacular centerpiece. Or is it a last minute scrabble to get the table laid before the food goes cold? In truth for most of us it's a mixture of both. The best laid plans can sometimes go awry in the hustle and bustle of Christmas morning. So here's some inspiration from our favourite high street stores to get things back on track. By contrast House of Fraser have pulled out all the stops. You'll need your best china and table linen to create this look. A simple vase of eucalyptus leaves and some plain crackers look very sophisticated in this setting and it will all look even better after dark when the candles will flicker away. Not the usual colour scheme for Christmas day but oh, so pretty. Follow Debenhams lead and decorate the chair backs with some sprigs of foliage and the baubles you couldn't fit onto the tree. A liberal sprinkling of gold and a combination of royal blue and green gives this table from Dunelm an Art Deco feel. One that the grown-ups will appreciate. 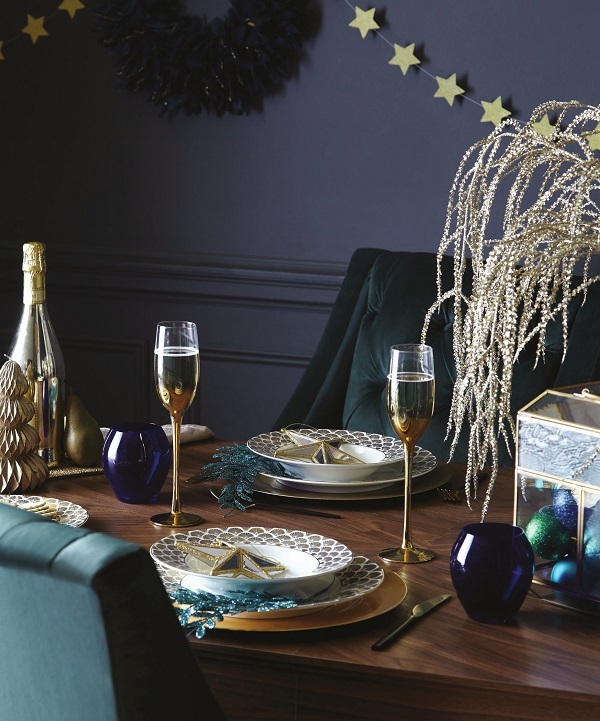 Be the hostess with the mostess this New Year's Eve with this glittery range from Talking Tables. 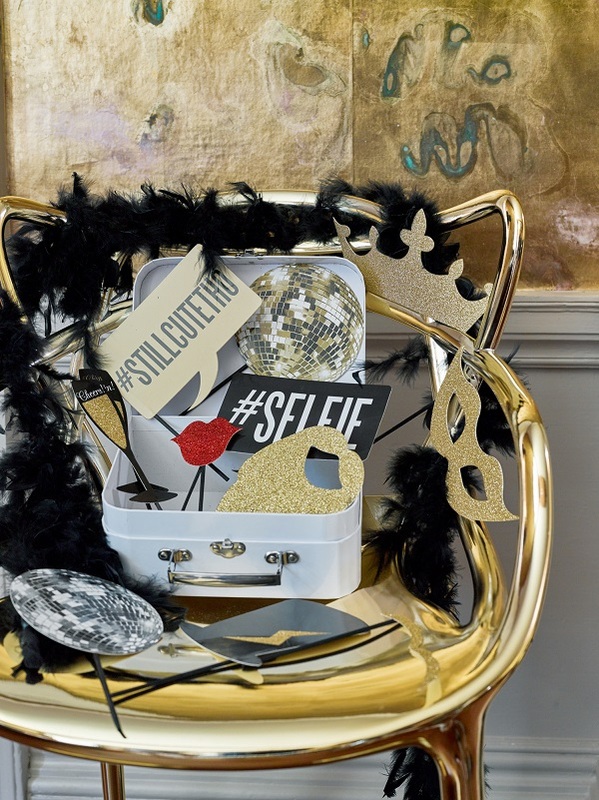 It's full of eye-catching paper partyware, confetti cannons, glamorous table bombs, shiny backdrops and disco balls! Because let's face it, once the festivities are over who wants to face a mountain of washing up? Talking Tables was founded by Claire Harris who spotted a gap in the market for design-led, stylish party accessories to decorate with. The typical products on the market at the time were dull, miss-matched and often just designed for children so she decided to create her own. And the company name came about because Claire wanted to get the table talking. We think it'll do more than that! If this is the week that you are going to wrap up (pun intended) all of your Christmas shopping - first of all, what took you so long? - secondly you might be interested to know about this helpful partnership. 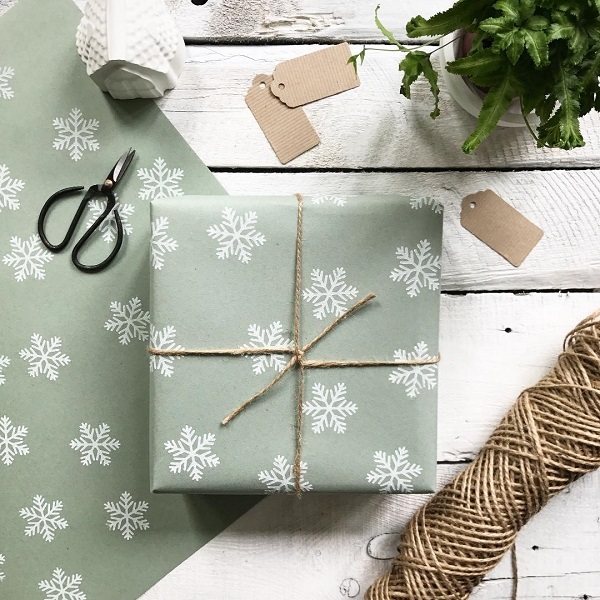 Covent Garden has announced a brand new exclusive range of designer Christmas wrapping paper, gift tags and cards in collaboration with the British Fashion Council and SHOWstudio. 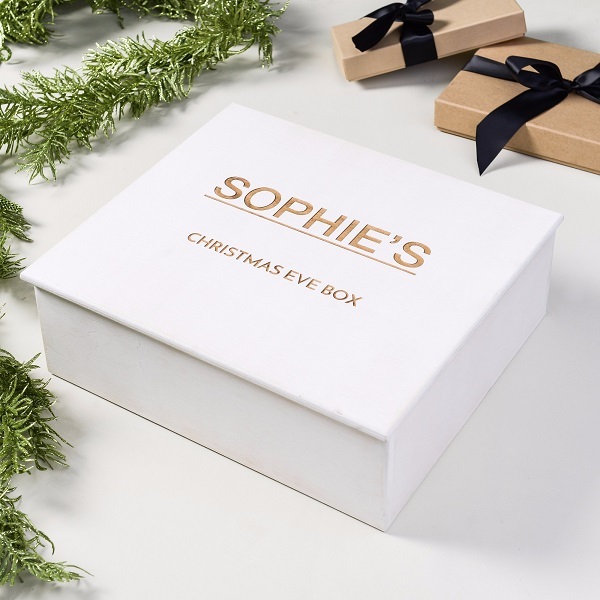 The best news is, you can take advantage of the in-store wrapping service or receive complimentary gift wrapping when spending £200 in stores across Covent Garden. Now that's an offer you can't refuse. The six limited edition designs are from British designers Holly Fulton, Fyodor Golan, Marques’ Almeida and Mother of Pearl, as well as additional pieces by neon artist Lauren Baker and SHOWstudio fashion illustrator Fiona Gourlay. 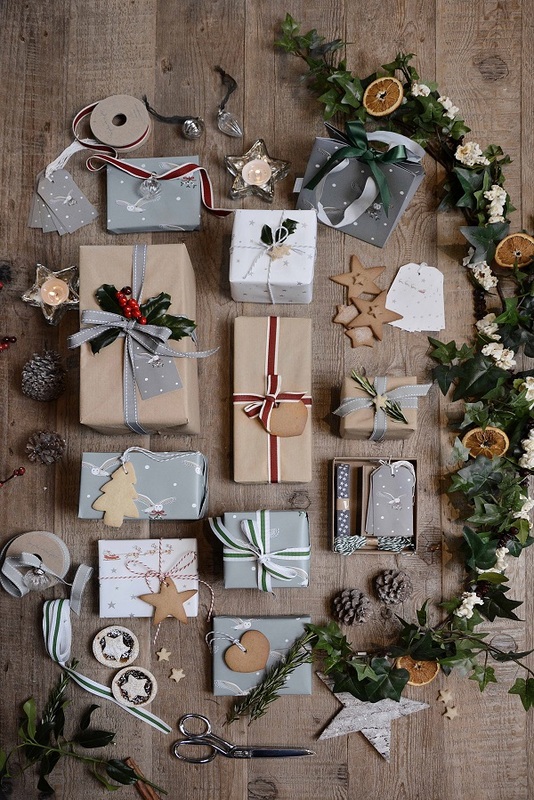 The bespoke wrapping paper, cards and tags will be on sale at the Noël Pop-Up In Covent Garden and can also be bought online here. If like us, you're struggling to find Christmas gifts that are just a little bit different. And a little bit personal. 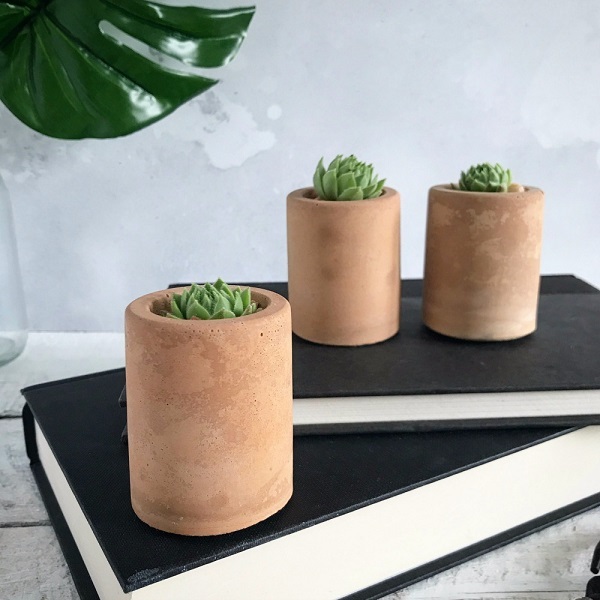 Let us introduce you to MicroMkt.co.uk, a new online marketplace where you can shop for the very best handmade products, directly from the artisans who made them. It's a new online home for creative micro-businesses – a thriving community and marketplace where anyone can turn their creative hobby, passion or skill into a business of their own. And where we can support small artisans and shop small, keeping independent business owners up and running and sourcing totally unique, creative products and services we wouldn’t normally find. Christmas wouldn't be Christmas without a festive wreath hanging on the front door. And while we love the fresh variety there's a lot to be said for an artificial wreath. They last for several years for one thing, and they are much more realistic looking than you might expect. There's also an added bonus if you haven't already bought one, as many of the stores are now discounting prices. Plum Floral Wreath, £29.50, Marks and Spencers. Beautifully handmade and decorated with pretty Plum roses, berries, pinecones and a mix of foliage giving a really natural feel. 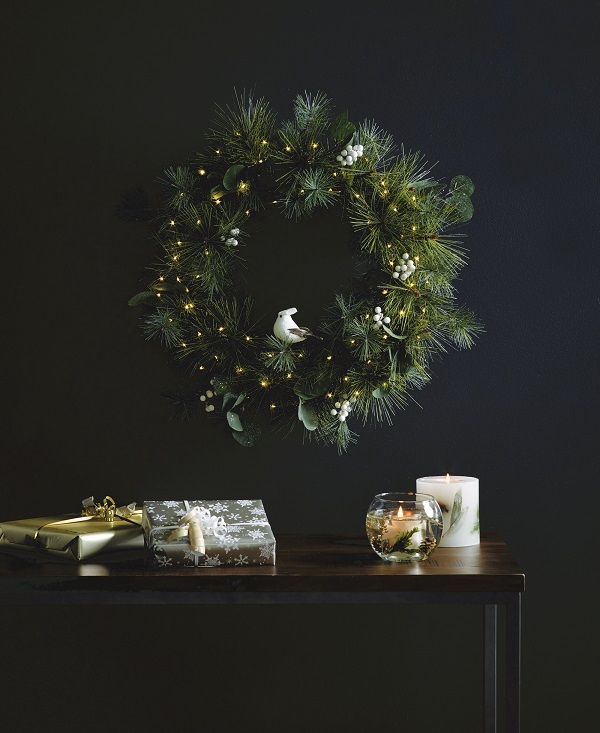 Rosemary & Pinecone Wreath, was £50 now £35, The White Company. 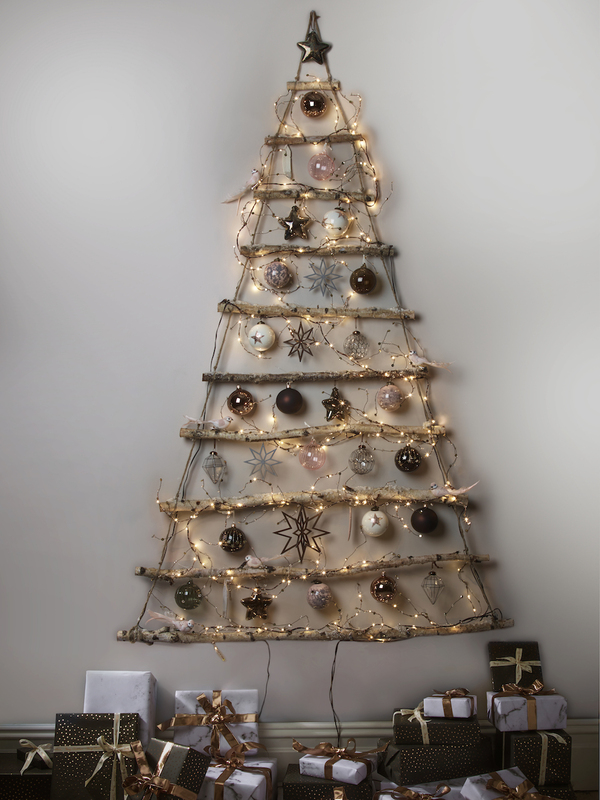 Artificial pine-tree branches with frosted winter berries and genuine pine cones that are finished with a white-frosted effect. Large Winter Berry Wreath, £45, Cox and Cox. Three different types of foliage for an authentic feel, finished with a lightly frosted effect and pure white berries. Silver Reindeer Wreath, was £50 now £35, Debenhams. Realistic pinecones and a majestic silver reindeer. Eucalyptus and Berry Wreath, £45, John Lewis. A traditional yet festive wreath studded with white and red berries. Physalis Wreath, £59, Bloom. Skilfully woven from sprigs of faux physalis. 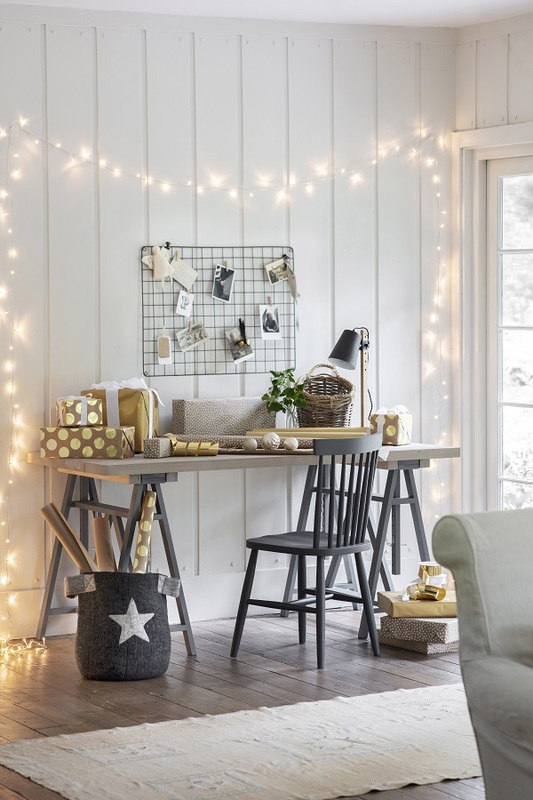 What are your plans for decorating the house this Christmas? Are you the type who likes a traditional approach? Using the baubles collected over the years and loving wrapped every January to bring out again in December? Or do you like to ring the changes every year with a new theme? We like a bit of both approaches here at Heart Home. We love to bring out the family heirlooms at Christmas, but love to add some new treasures too. And we're loving the Autumn/Winter range at Brissi. 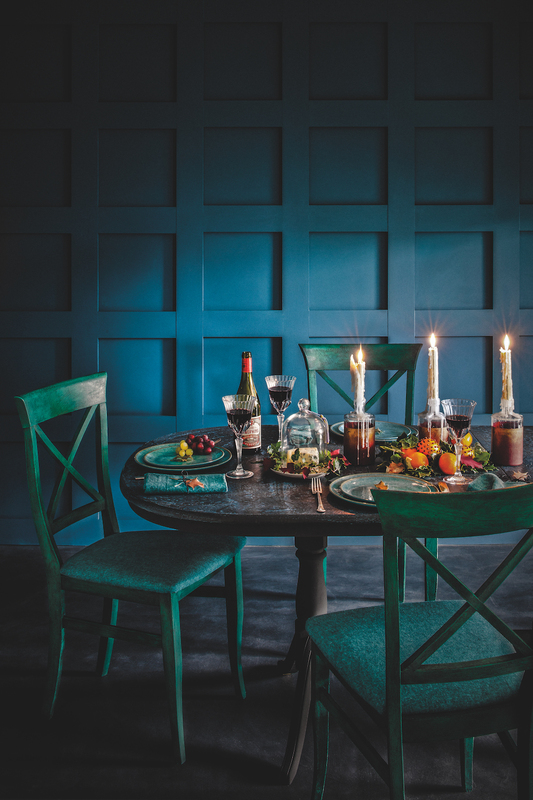 Chic, understated luxury, is what it's all about and the new products will inject darker hues, rich tones, warmth and cosiness into your home in time for the new season. But they won't look out of place with things you already own. That's what we like. A simple vase of faux flowers and a couple of festive ornaments is all it takes to make the entrance hall welcoming to guests. Keeping to a simple colour scheme means that old and new decorations will work together. We love this silver, gold and green theme. And faux stems and silk flowers will be your best friend this Christmas. No wilting, no going brown. All images courtesy of Brissi. There's nothing more satisfying than making your own Christmas decorations. Especially if you get the whole family involved. So, if you had a go at our Scandi Christmas baubles last week and loved them, why not make this Geometric door wreath as a contemporary alternative to the more traditional green foliage and pine cones? 1. Gather your chosen foliage and ensure it is completely dry before starting your project. Move the foliage to a well-ventilated space and place on top of a dustsheet or some old newspapers. DIY Scandi Christmas baubles that even we could do! The woods and hedgerows are full of seed heads and fallen leaves at this time of the year so it's the perfect time to get one step ahead with the Christmas preparations. 1. 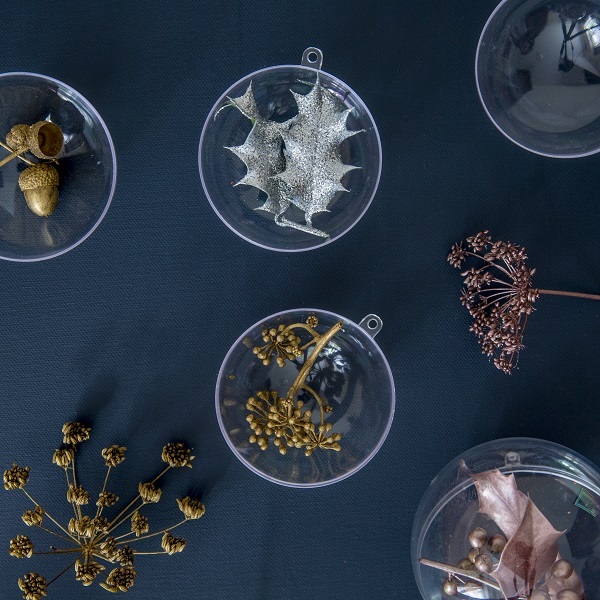 Gather up your chosen foliage and ensure it is completely dry before starting your scandi Christmas baubles. 2. Move the foliage to be painted to a well-ventilated space and place on top of a dustsheet or some old newspapers. 3. Take your chosen cans of Rust-Oleum spray paint and shake thoroughly. Hold the can approximately 30cm from the surface of the foliage and spray. Apply several light coats a few minutes apart. 4. Leave to dry in a well ventilated place. 5. Once dry, pop your foliage inside the fillable baubles. 6. Tie your baubles up with colourful pieces of ribbon. 7. 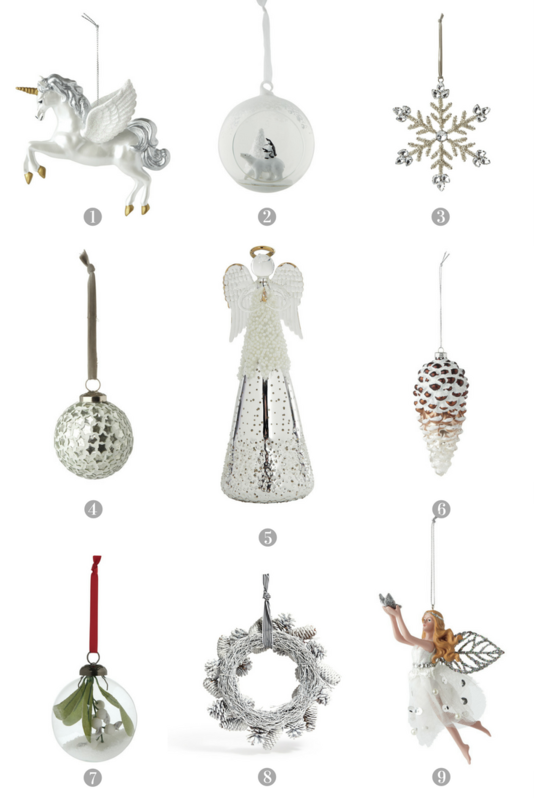 Hang your baubles on your tree or around your home. Wall: Bottom half painted in Wall Paint in Duck Egg Blue; top half painted in Wall Paint in Old White. Floor: Floorboards painted in a wash of Chalk Paint in Old White and finished with Lacquer. Cabinet: First a thick, textured coat of Chalk Paint in Duck Egg Blue was applied using a Large Pure Bristle Brush. Once dry, a second coat of Chalk Paint in a mix of Duck Egg Blue and Old White was applied. The piece was left to dry before applying a layer of Clear Chalk Paint Wax. The medium coarse Sanding Pad was then used to slightly distress the paint – revealing areas of the darker Duck Egg Blue layer below. A final coat of Clear Chalk Paint Wax protected the finish. Decorations: Large Pine Cones - Using a Medium Pure Bristle Brush and Chalk Paint in a palette of Duck Egg Blue, Old White and Scandinavian Pink, paint was stippled in to all of the nooks and crannies of the pinecones. To get the paint flowing and covering between the layers a little water was added to the paint. Once the paint was nearly dry, the paint was gently removed from the edges of the cones using a damp cloth. Wreaths - Branch twigs were woven and fastened together in to circular wreaths, leaving some of the leaves to poke out. 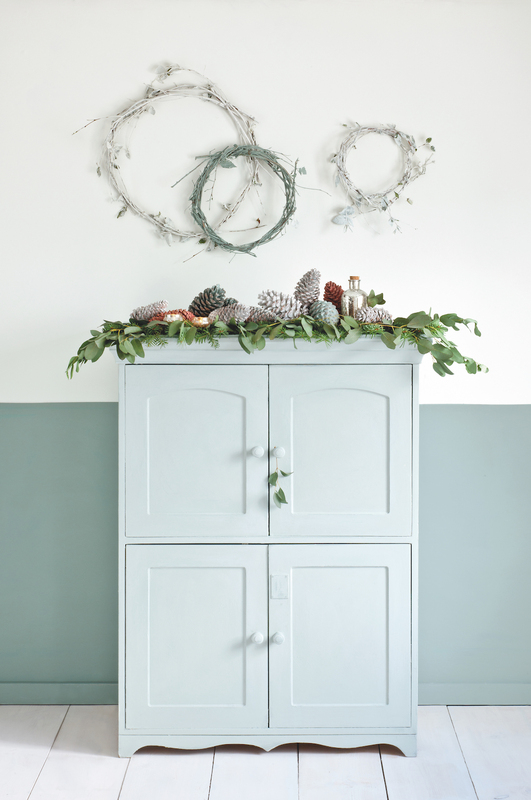 Using Chalk Paint in Old White the largest and smallest wreathes were painted all over, using a Pure Bristle Brush. The middle size wreath was painted in Chalk Paint in Duck Egg Blue. Once the wreaths were almost dry a damp cloth was used to remove a little paint. Wall: Wood paneling painted in Wall Paint in Aubusson Blue. Floor: Concrete floor painted in Chalk Paint in Graphite and finished with Lacquer. Chairs: Painted thickly in Chalk Paint in Florence using a Pure Bristle Brush to create lots of texture. Once dry a layer of Clear Chalk Paint Wax was applied and lashings of Black Chalk Paint Wax were worked in to the still wet Wax, to bring out brushstrokes. Using a lint-free cloth excess wax was removed from the surface. The chair seat pads were upholstered in Annie Sloan Coloured Linen in Aubusson Blue & Provence. Dining Table: The table was painted in Chalk Paint in Graphite. Once dry, the paint was sealed with Clear Chalk Paint Wax. While the wax was still wet, diluted Aubusson Blue was painted on to areas of the table. Using a piece of scrunched up newspaper that was then flattened out again, the paper was pressed against the table and rubbed all over, applying a moderate amount of pressure. This removed areas of the top coat of paint, leaving it uneven and blotchy. (Applying a coat of Wax, which is oil based, before the paint, which is water based, creates a ‘wax resist’ which means the paint either runs off or collects in pools and beads.) To finish the piece Clear Chalk Paint Wax was applied – to make the surface wipeable. Napkins, Holly and Ivy: The napkins were made from Coloured Linens in Aubusson Blue & Provence, decorated with a piece of holly painted in Chalk Paint in Scandinavian Pink and finished with Warm and Bright Gold Gilding Wax. Then tied in waxed black string with the tips finished in Warm and Bright Gold Gilding Wax. Various holly and ivy leaves on the table were painted in Chalk Paint in Burgundy with some finished with a mix of Warm and Bright Gold Gilding Wax. Bottles: An inch of the top of the glass bottles was masked off with tape. Slightly diluted layers of Chalk Paint in Burgundy were gradually then applied to the rest of the bottles. Once the colour was looking opaque it was left to dry, before adding a mix of Warm and Bright Gilding Wax to the bottle using a Stencil Brush. Gently working the Gilding Wax out from the top line to create a subtle ombre effect. Once dry, the masking tape was removed to reveal a crisp clean line. Wall: Wall Paint in Antoinette. Floor: Chalk Paint in Paris Grey, finished with Lacquer. 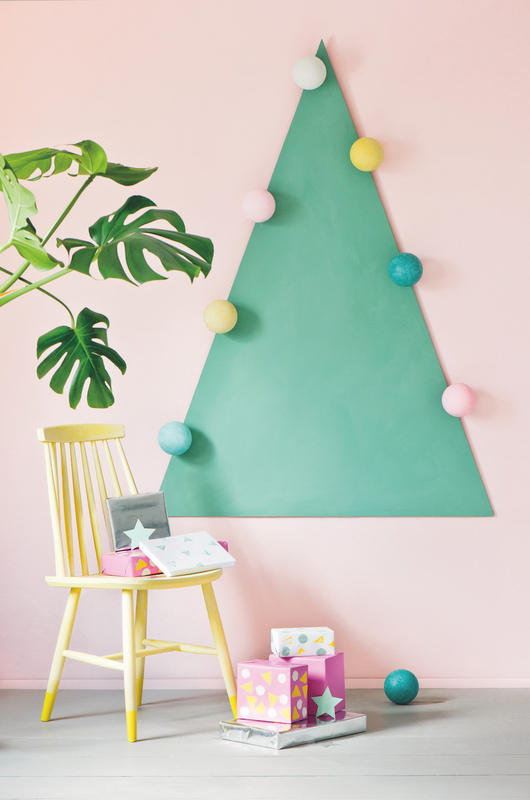 Christmas tree: Triangle cut out of MDF – painted in Chalk Paint in a mix of Amsterdam Green and Old White. 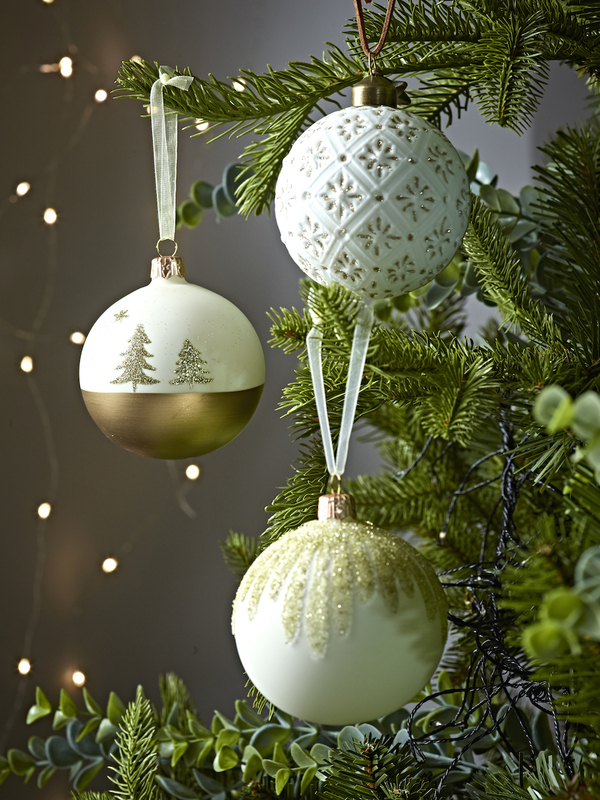 Baubles: Plastic baubles painted in a palette of Chalk Paint in English Yellow, Florence, Old White, Antoinette and a mix of Florence and Old White. A couple of these were finished using either White or Black Wax to highlight the texture and darken or lighten the colour a little. Chalk Paint in English Yellow painted with a Pure Bristle Brush to create texture, and once dry, finished with White Chalk Paint Wax, leaving the ‘socks’ of the chair in the vivid English Yellow, without the White Clear Wax. Wrapped with paper that had been hand printed/stamped with Chalk Paint in a palette of Duck Egg Blue, Antoinette, English Yellow, Old White. Visit www.anniesloan.com for more details. Discover Cox & Cox's five key looks for Christmas 2017, featuring trees, decorations, lighting and wrap designed to delight and inspire. From on trend botanicals and decadent copper to Scandinavian inspired motifs and classic red and gold, each look is completely unique and perfectly festive. Inspired by vintage stateside glamour, this look pairs the most luxurious tree with deep, berry red and rich gold decorations. Finished with a generous scattering of gold wrapped presents, it is reminiscent of grand New York hotels in days gone by. Perfectly festive and wonderfully fun, the traditional look is packed with sweet felt animals and jewel bright glass baubles in red, blue and white. Whimsical but stylish, it’s the perfect look for a family home. 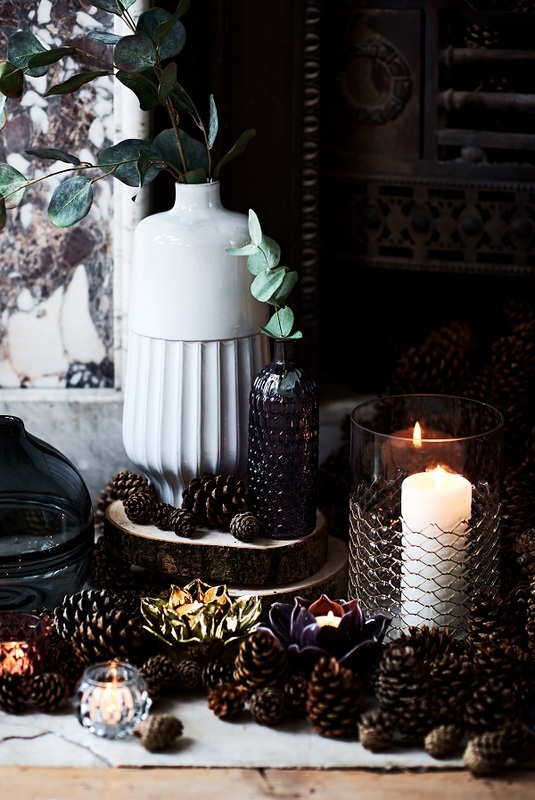 A winter woodland of muted tones, forest motifs and natural textures. A touch of opulence comes from subtle gold shimmer and glossy pearlescent baubles. Accented with lit star motifs and marbled finishes, the opulent story is centered around rich, warm copper, pale blush and dark chocolate, enhanced by the blue-green tones of our Blue Mountain Spruce. 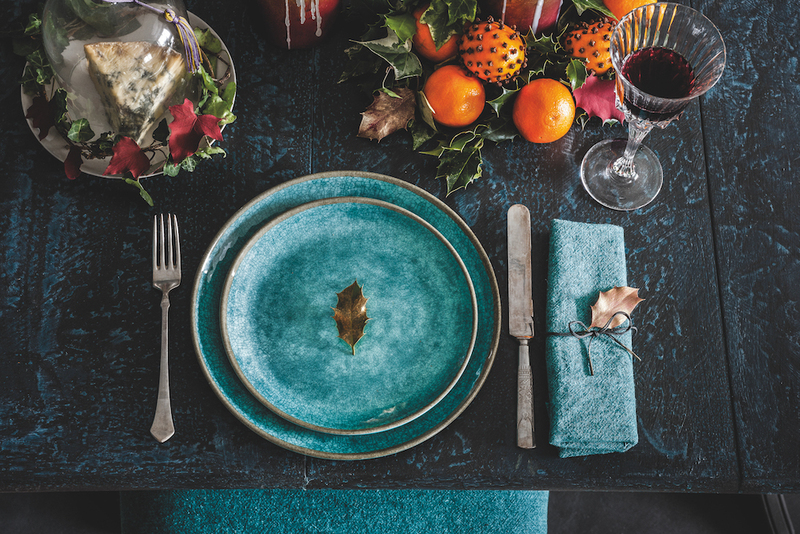 Fresh but luxurious, the botanical look is a festive spin on this year’s key colour palette. Contemporary Indoor Outdoor Tree is paired with mustard, golden olive and forest green baubles, and enhanced with mixed foliage. Christmas doesn’t have to be about glitter and glamour. Adopt a back to basics approach to the holidays this year with some home made decorations, some good old fashioned baking and some artful displays. A cluster of metallic and dark green vases look even better for their simplicity. Spray paint a few twigs from the garden and just add a ribbon. Baubles casually displayed on a brass tabletop will look even more eye-catching once the lights dim; allowing the warm colours to glow in candlelight. 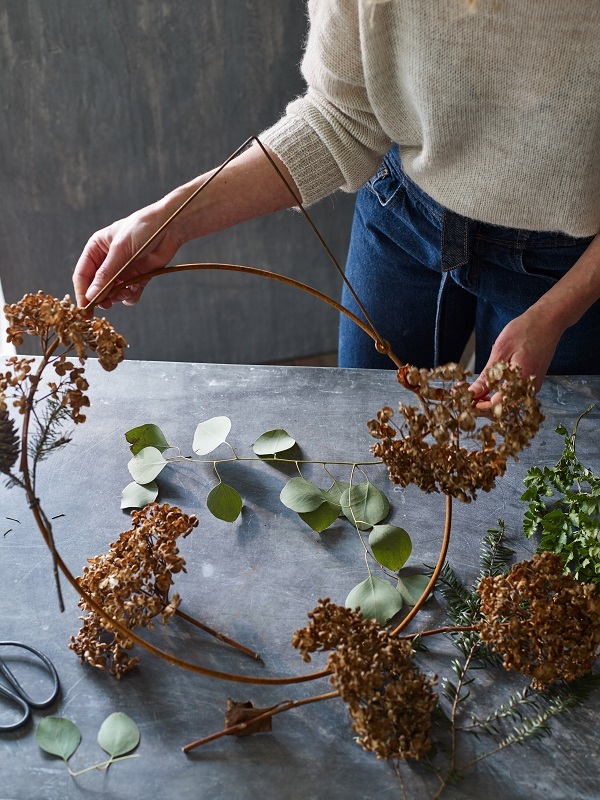 Gather twigs from the garden and gently bend into a circle shape and secure with wire. Spray white. Using a leaf template, trace onto grey paper and cut out leaves. 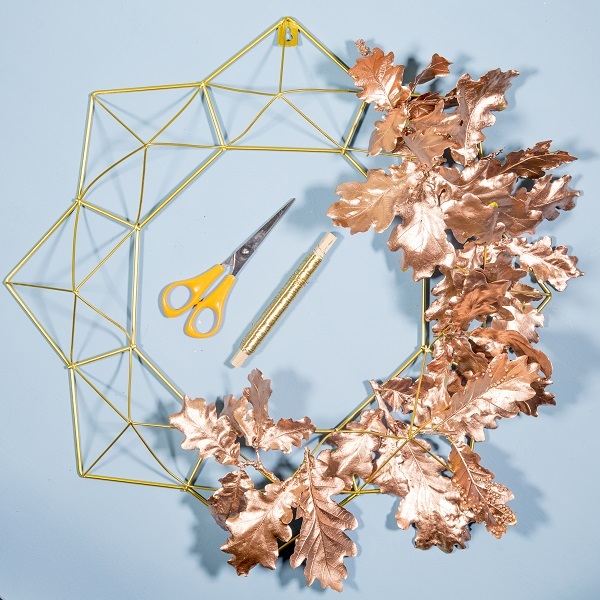 Attach the leaves onto the wreath with a glue gun. Layering as you go. When one side is done, repeat on the other side. Hang with ribbon. Cut a sheet of crepe to 60cm to 25cm. Fold in half. With the scissors cut strips of fringe, each about 1cm wide, leaving 5cm of uncut paper left at the folded edge. Open up the paper with fringing either side with a solid section in the middle. Start to roll the paper, using the solid centre. Be careful not to tangle the fringing. Then curl it on itself and twist over the string to secure. Photographs by Andrew Boyd, styling by Claire Boyd. Taken from the Heart Home winter 2013 issue.